A Lazy Thursday – Excellent! After the glamour of yesterday’s DC adventures and the horror of waiting two hours to get into a locked car, today’s blog post will be pretty tame. Which is kind of the point, because Elizabeth and I both wanted a lazy day to emotionally recuperate. We are both introverts, after all. This morning was slow, and when we finally left the apartment, it was to take Elizabeth’s car into the shop. 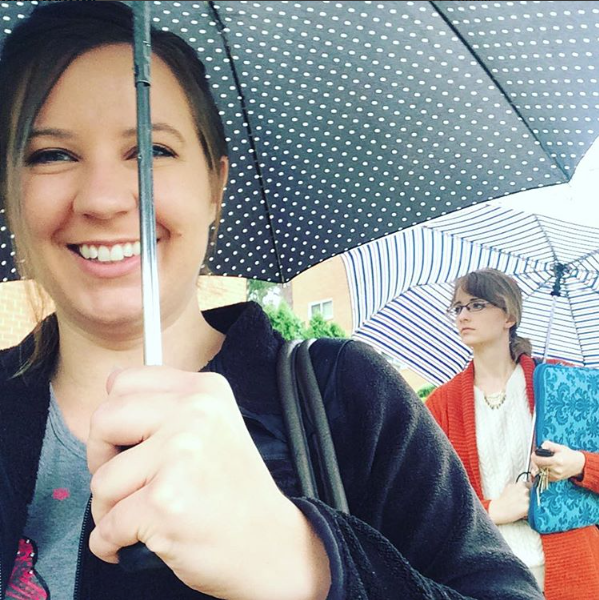 We crossed the street in the rain (finally, a chance to wear rainboots, a jacket, and carry an umbrella!) and spent three hours blogging and Internet-ing at the Asian Bakery Cafe. I had bubble tea, and we admitted we weren’t done with the Asian theme begun yesterday. We grabbed bahn mi (a Vietnamese sandwich) on the way home, and we almost crashed. We rallied, though, for the all-important trip to….the library! I know, I know, we are such nerds. But this is why I love Elizabeth so much. A slow day culminating with a library visit is equally as satisfying to both of us. And what a library! Rockville’s is two stories, very fancy, and I immediately wanted to read everything. Instead, I simply got a children’s book on St. Francis, since this Sunday is the Feast of St. Francis and I love him. “We should look at cookbooks!” Elizabeth suggested, but we were walking by something far more appealing. I grabbed the magazine, she grabbed the cookbooks, and I proceeded to interrupt her every two seconds with something funny and/or profound that he was quoted as saying. I’m fascinated by his humor and wisdom, and in particular, his GQ quote that he agreed with Tolkien’s statement that even God’s punishments are gifts. This kickstarted a conversation about G. K. Chesterton’s assertion that Christianity embraces contradictory ideas and how much I want to be wise enough to believe two seemingly opposing statements at once (like we have free will and God is sovereign). The magazine was too short, so I grabbed Lisa Rogak’s And Nothing But the Truthiness, a biography on Stephen Colbert. After a stop at the grocery store, a dinner of reheated homemade macaroni and cheese with a side of acorn squash (Elizabeth is an amazing cook, I just do the dishes after), I read and read and read. Which is pretty much exactly how I like to spend my Thursday nights. Previous Article New Blog Series: Letters Between Friends!